This post is coming a little late in February – to be honest, I haven't as much as opened my laptop in weeks! 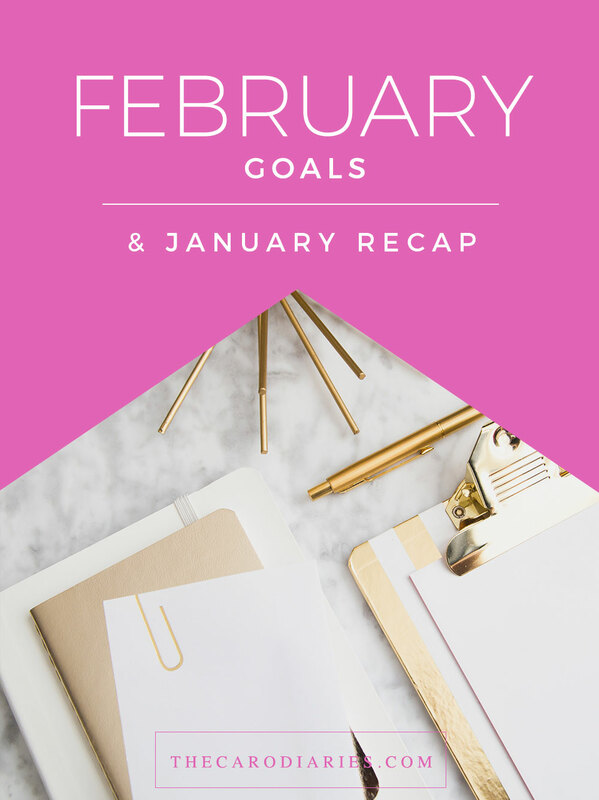 But I committed to blogging and I'm trying my best for 2019, so here we go..
Can you believe we're already in February? I feel like I say this every year, but January always feels soOoOoOo long, and then the rest of the year flies by, and it's looking like 2019 is no different! But let's see what I want to accomplish in February! 1. RE-COMMIT TO THE BLOG // Can I give myself partial credit for this? While I didn't blog at all since my last goals post, I drafted several posts, brainstormed a ton of ideas for my content calendar and slowly got back into Instagram Stories. I know I need to be more consistent across all channels, but it's been so difficult transitioning with work, and it's a crazy time of year, but I'm positive I'll be better! 2. PERSONALIZE MY SPACE AT WORK // I definitely didn't do as much as I'd hoped, but I did bring in little details that reflect who I am to make my office feel more 'me'. I think this'll be a passion project throughout the year, and month by month I'll see small changes, but I started by bringing in some candles, a personalized calendar featuring photos of the kids in my family, a desk clock, a little acrylic box with my name on it, pen holders and a cute little decor sign. So while it's not perfect, I'm chalking this as a win! 3. SAVE MONEY // In January, I actually did pretty well at not spending money unnecessarily. Besides the must-haves like gas, groceries, my gym membership or medication, I avoided spending in the month of January and I really impressed myself. I'm hoping to continue this 'no-spend' trend as much as possible throughout the year, but it's so hard! 4. CUT OUT DIET SODA // I am SO proud of myself for this one! For the first two weeks, I completely cut out diet soda, and I was feeling so good! Then, I would allow myself to have a sip of one if I wanted, without feeling like I needed to have the rest. I definitely slacked a little bit lately and have been having one more often than I would like (though still WAY less than I'm used to, so it's good?) and I want to cut down even more. 5. EXERCISE 5 DAYS A WEEK // I'm giving myself partial credit because some weeks, I exercised more than 5 days, while others I fell short at 3-4 days! But I'm definitely more active and that was the overall goal, so this is a win! TOTAL: 4/5: Definitely not my worst month – I'm proud of myself for sticking to most of these! 1. READ SIX BOOKS // Carnival is the first week of March, and I know that week is going to be crazy and I'm not going to have enough time to read at all, so I'll probably fall behind if I'm going for the 'one book a week' idea. So I want to get ahead of myself and read a couple extra books this month in anticipation of those hard weeks! 2. EXERCISE 5 DAYS A WEEK // Bringing this January goal with me to February, especially because Carnival is around the corner (oh my goshhh!) and I need to feel comfortable and be fit for the road! I'm hoping to train 5x a week, but also planning to get workouts in wherever I can! 3. FINALIZE MY CARNIVAL ACCESSORIES // This is less of a goal, and more of a must-do, but Carnival is around the corner and I feel so disorganized. I haven't even figured out what I'm wearing on Carnival Monday, or ordered my boots or anything yet! So I definitely need to get on Amazon and figure all of that out ASAP! 4. GET TO SLEEP EARLIER // For the most part, I've been so much better at getting to sleep earlier, but I still find myself staying up late some nights, whether it's reading, playing games on my phone or just doing work, and I definitely pay for it the next day when I'm falling asleep on myself in my office. 5. TRY SOMETHING NEW // I think one of my biggest flaws is my hesitance to try new things sometimes, even when it comes to the smallest things, so I'm hoping to try something new this month – maybe it's a food, maybe it's an exercise, maybe it's a new hairstyle.. whatever it is, I'm excited to try! So, for the most part, my goals are all self-improvement goals, but I'm excited to see if I can get through them this month! These are such awesome goals! I'm trying to exercise more too this month! These are great goals! More sleep + exercise are big ones for me too! These are great goal ideas! This month I want to move towards posting once a week, instead of twice a month for maximize my growth and start working with brands. You did amazingly with January's goals! I wanted to exercise more and did the same, some weeks I did more and some less but it was an overall win! It's so satisfying. I like the try something new goal, might have to do that one too! January for real is the longest month ever though. Overall, you did a pretty good job on your January goals, so hopefully you bring that success into February. Getting to sleep earlier is one of my goals too! I'm so bad about it since I don't have to work till 1 pm during the week. Wonderful goals and congrats on achieveing most of your Jan goals! Good job with your goals last month and good luck in February! I'm trying to work on going to bed earlier! Good luck with all your goals this month! I think my main goal is to just work on my classes and read as much as I can haha.